Did you have a dream about fire or flames? Fire can happen in our dreams in a number of different forms and can be a very powerful symbol. 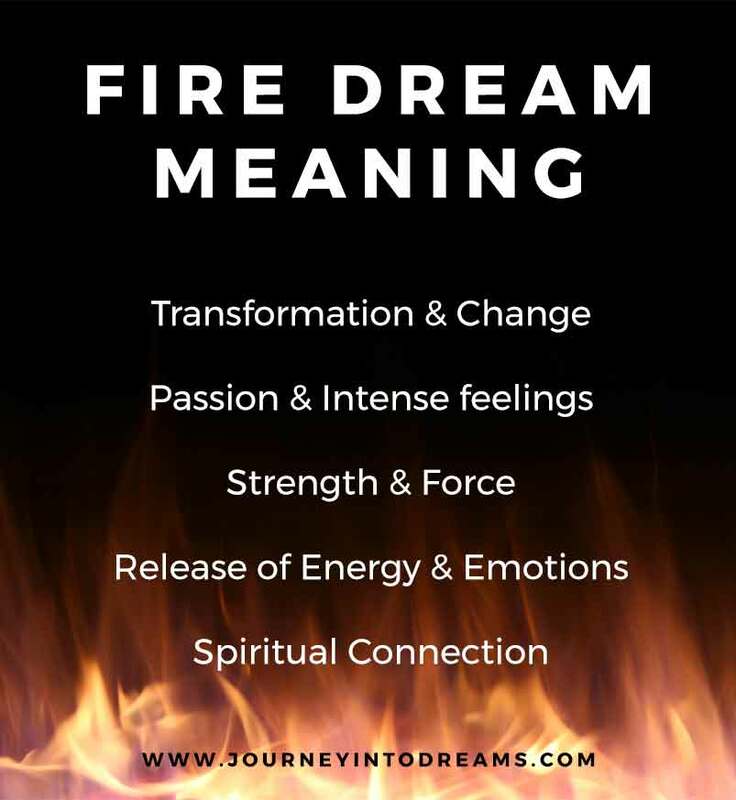 Learning about the dream meaning of fire can help you better understand what your dream means. What Does it Mean to Dream of Fire? When we dream of something destructive, such as fire, it often is a symbol of change and transformation. When something is burned in a fire, it is no longer in its original form, often completely unrecognizable. When you dream of something being on fire, or even yourself on fire, it can mean that you are experiencing a significant event in your life that will ultimately change you. We often also associate fire with passion. The saying and expression "really fires one up" can mean that someone has very intense feelings about something. We also sometimes associate passionate feelings with love and relationships. You may wish to explore what it means to dream about people. Dreaming about fire could also be a symbol of Strength and Force. Just as it can mean strong feelings about something, it can also mean there is a force in your life that seems difficult to overcome, or a strong force may even be working along with you to help you reach your goals and aspirations. Just as flames in a fire can mean transformation, it can also be a release. Many people practice release ceremonies using fire in order to symbolize a final transformation and change from what was. If you are releasing a lot of emotions, or holding a lot of feelings which may need released, this is often the meaning of this symbol in your dream. Fire is often also associated with a number of spiritual meanings. Ironically, it can be the symbol of the Holy Spirit in Catholic teachings - or a symbol of the fire & brimstone of the hot home the devil. As a symbol for the Holy Spirit, it reminds us to think of the burning bush on Mount Sinai from which God spoke to Moses - this is a symbol to draw into the power and strength of faith and a higher power. To Dream of Your House Being on Fire: A house in our dreams often symbolizes ourselves. You may have very intense feelings towards something or there is something in your waking life that is bringing out something you are very passionate about. Pay attention to how you feel in the dream - do you feel as if things are out of control in your life, or do you feel as if there is a sense of excitement and transformation? Wildfire or Forest Fire: A wildfire can symbolize one's feelings being very intense and out of control, or it can mean one fears being out of control. Fire in an Apocalypse: Sometimes we may dream of fire being severely destructive in our lives. See the meaning of an apocalypse to understand this dream further. A Small Flame, Such as a Match Being Lit: If you see a small flame, such as a single match being lit, this could be a symbol for finding your inner spark - do you recognize your true passions in life? You may be looking for a sign of hope in your waking life. Candle Flames in Dreams: If you dream of a candle being lit, this could mean you are honoring something or someone from the past and grateful for the experiences or lessons learned. A candle can often be a sign of release. The color of the candle could also have some significance, as candles are often used in spell work and other types of meditative activities. Dreaming of a Campfire: Campfires are a place for social gathering and to unwind. If you dream of a fire with a group of friends, it could mean that you feel a spiritual connection with these people or others in your life. Dreaming of Being Burnt by Fire: To dream you are being burnt could mean that you are in the process of exploring new things and are worried about disappointment or loss from upcoming changes happening. Walking Over Coals: You may feel like you are being tested by someone in your life. This may be a sign from your higher self to remind you that you have what it takes to achieve your goals and overcome things that may seem impossible to others. Cooking Over a Fire: Cooking over a fire most definitely is a sign that you are in the process of creation. You may be thinking about the type of work that is necessary to achieve an outcome which you are passionate about. Do you have a dream about fire that you would like to share? Tell us your dreams involving fire in the comments below!